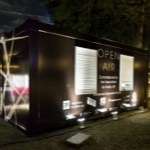 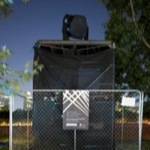 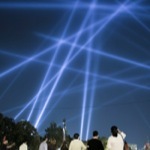 Rafael Lozano-Hemmer - Project "Open Air"
Opening night on September 20th. 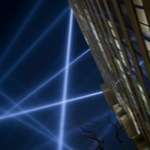 Improvised performance by Rahzel and David Moss. 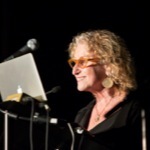 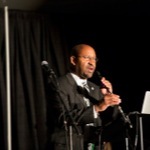 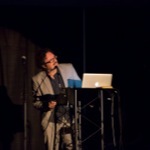 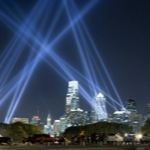 Philadelphia Live Arts, Association for public art, Philadelphia, United States, 2012. 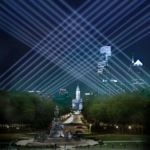 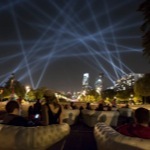 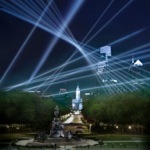 Open Air was an interactive art installation designed to transform Philadelphia’s historic Benjamin Franklin Parkway, between September 20 and October 14, 2012. 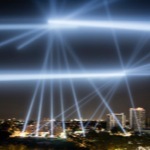 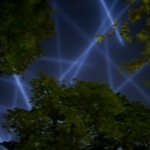 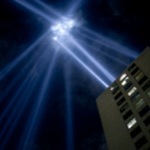 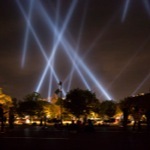 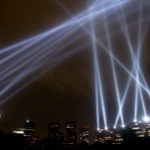 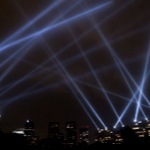 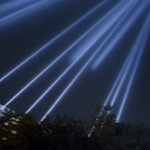 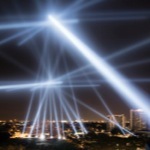 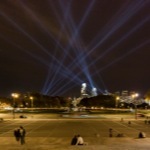 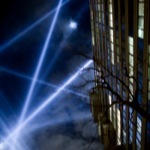 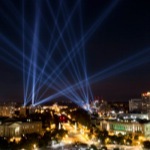 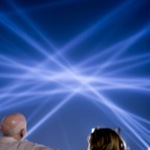 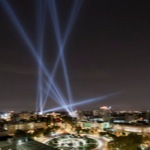 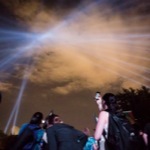 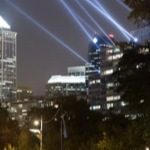 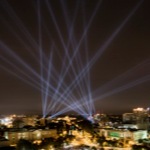 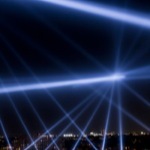 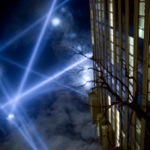 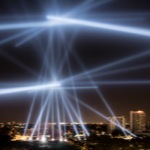 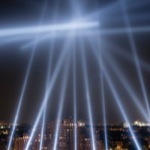 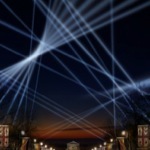 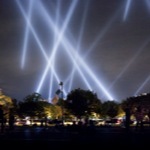 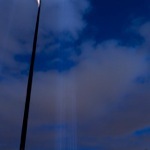 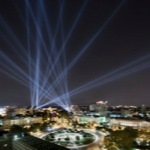 In this project, twenty four powerful searchlights created unique, dynamic light formations in the sky which reacted to voice messages sent by participants using a free mobile app and this website. 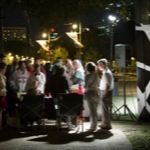 The public was invited to record and submit messages of up to 30 seconds in length — shout-outs, poems, songs, rants, dedications, proposals. 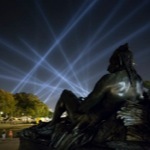 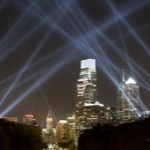 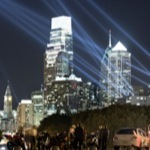 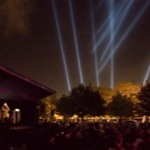 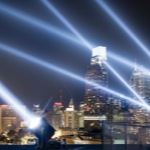 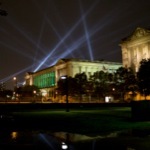 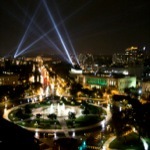 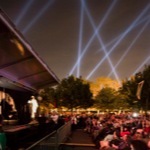 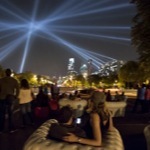 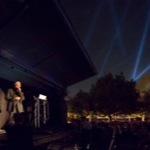 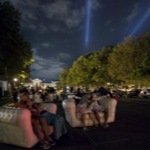 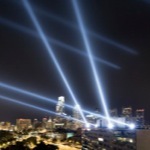 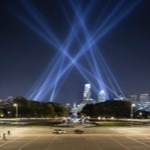 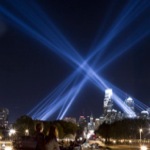 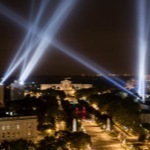 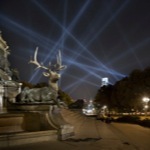 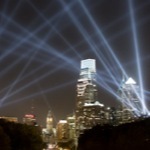 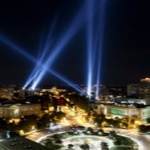 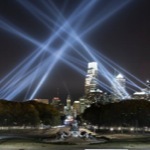 As the messages played back in Philadelphia, the lights reacted in brightness and position to the frequency and amplitude of the voice recordings, which could be heard through the mobile app, the website and public speakers located at the Project Information Center at Eakins Oval (24th Street and the Parkway). 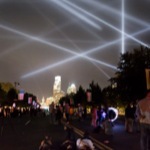 Priority was given to mobile app messages sent live from the Parkway during the show, but messages could also be sent through this website at any time. 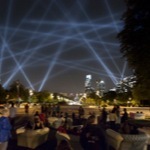 Messages submitted through the web were archived and played-back by the lights if other web visitors rated them highly. 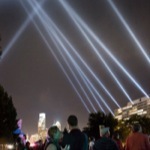 A personalized webpage was created automatically for every participant, featuring their message, comments, rating and images of the light designs that their voice created. 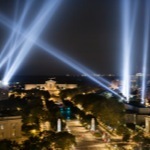 Depending on atmospheric conditions, Open Air could be seen up to 10 miles away from the Parkway each evening from 8 to 11 p.m. 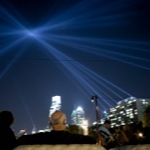 The Project Information Center at Eakins Oval was equipped with app download, free mobile loan stations and seating areas for watching the lights and listening to the messages. 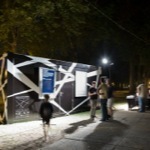 There was also be an Information Outpost located at Sister Cities Park (18th Street and Logan Square). 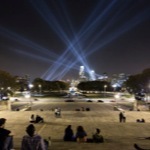 The Open Air voice archive also features selected "Voices of Philly," recorded messages from distinct individuals both past and present who have inspired and influenced the flavor of Philadelphia. 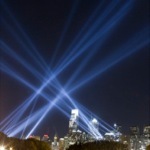 "Voices of Philly" messages are accessible on this website and were played at various times throughout the project. 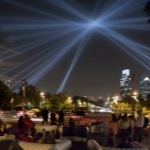 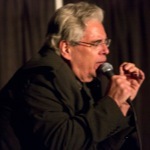 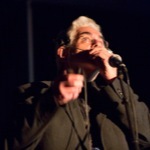 Content for "Voices of Philly" was collected by project partner WHYY executive producer Elisabeth Perez-Luna and includes David Lynch, Sonia Sanchez, Sun Ra, Louis Kahn, M. Night Shyamalan, Tina Fey, ?uestlove, Marcel Duchamp, Buckminster Fuller, Jimmy Heath, Santigold, Maurice Sendak, Patti LaBelle and many more. 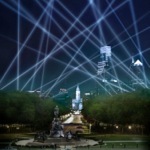 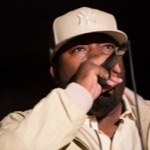 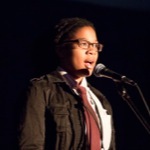 Inspired by the city’s rich tradition of democracy and respect for free speech, Open Air was at once a visible voicemail system, a rant line, a public stage and an archive of recordings from Philadelphia’s past and present. 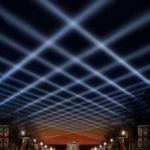 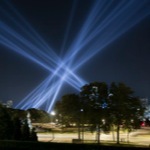 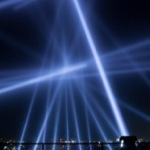 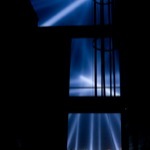 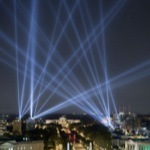 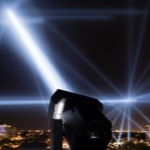 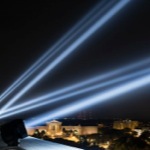 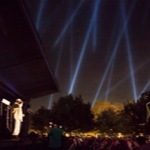 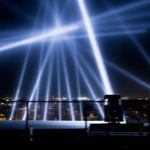 The piece was the largest and brightest to date of Lozano-Hemmer’s searchlight installations. 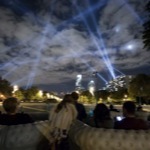 Despite its monumental size and its wide visibility, the project was not intended as a cathartic pre-programmed spectacle like a fireworks display or a son-et-lumière show. 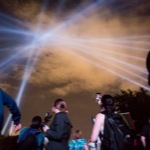 On the contrary, the piece was designed to attract personal participation that created a sense of global connection, complicity and public agency. 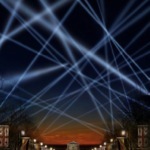 Keywords: outdoor, lights, tracker, recorder, database, networked, robotic, sound. 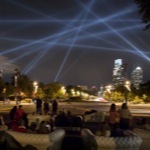 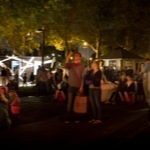 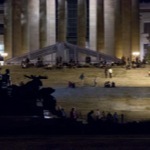 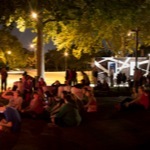 Open Air, Philadelphia Live Arts, Association for public art, Philadelphia, Pennsylvania, United States, 2012.